Seen in the picture below is a photograph showing a single view of a white gold wedding ring. 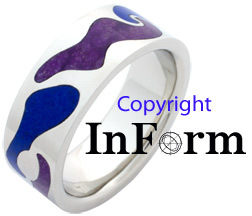 Exhibiting an otherwise very simple and wearable approach to the ring, the most notable visual elements are the three pairs of inlaid stones, each pair being a combination of lapis lazuli, which is an intensely blue semi-precious stone, and sugilite, a purple stone. Each pair of lapis and sugilite has a unique combination of shapes and visual interactions with the partner stone. ***Please note that a ring or rings bearing a reasonable degree of similarity could also be made, most likely establishing inlaid stones having different shapes and/or color or combinations of color. I'm able to make rings of platinum, palladium, white gold as well as other colors of gold.